If you’ve been traveling with me and our little raindrop, nicknamed Serendipity, for a while, you know very well the kind of crazy, magical “coincidences” she is capable of creating. On our 90-day road trip, my job was always to show up and then stay out of her way and, you’ll be happy to know, nothing has changed! First, some background – if you were near the Mississippi River in the years between 1995 and 2008, you might have been fortunate enough to see the magnificent American Queen. She is the largest river steamboat ever constructed with a capacity for 436 overnight guests. She and her smaller sister, the Delta Queen, took passengers on multiple-day cruises and it was a thrill even to catch them passing by. I was never among the fortunate ones onboard for a cruise, but it was always on my bucket list. When the economy tanked in 2008, both ships were taken out of service. Several smaller paddlewheelers continued to work from various ports offering day trips, but, sadly, it was no longer possible to travel overnight on a steamship on the Mississippi. The Delta Queen was converted to a floating hotel and the American Queen was dry-docked. I missed them – I missed their graceful, romantic presence on the River and all that they represented. So, I was thrilled when I heard the news that the American Queen had acquired new owners, was being refurbished and would be re-launched in 2012. I drooled over the photos of the elegant high-ceilinged interiors, the stunning grand staircase and the sunlit white dining room. I ordered a brochure and filed it away under “someday” – I was completely engrossed in writing for the upcoming book. A little later, still in the thick of writing, I realized that the American Queen has onboard presenters and lecturers for their guests – “Aha,” thought I, “that certainly seems like a good fit.” I mentioned it to my husband and said, “It’s not the time yet, but when the book is finished and the slide show ready, I will get in touch with them – and (not being cocky, but just sharing one of those feelings), I will be on that boat!” He smiled at me as he does and I went back to writing. So, here’s the crazy, serendipitous part. Picture this – I’m writing about Day 89, nearing the end but knowing it is essential that I stay right here on this day and nowhere else. I’m head down at the computer and an email comes in from a River friend that I haven’t heard from since the journey. Missy Falbaum O’Neill and I met over breakfast at the lovely Cottage Plantation B&B in St. Francisville, Louisiana. 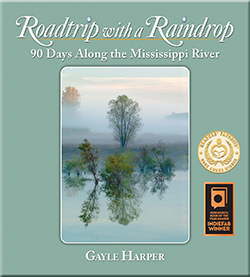 (Here’s a link to that part of the journey http://gayleharper.wordpress.com/2010/11/15/80-and-onward/ ) Missy and I had hit it off swimmingly, had a great conversation and she had even helped me by sharing some of her down-River contacts. Seriously?? Amazing, Serendipity – downright, flat-out amazing! So, just in case I need any additional motivation to keep working to bring all this together into a finished book, there is that shining gem among the possibilities ahead – that I will share Serendipity’s tales with a boatload of River-loving people aboard the sumptuous American Queen. I can just hear the happy smiles in your voice! That is so wonderful for you – and for those passengers! Yep a big ol’ smile! Thanks Karen! What a great story! Thanks for sharing! It’s fun to receive your updates. Hi Kim! Great to hear from you! Thanks Julie! Would be a great place to gather the troops! So glad you shared your story in such an inspiring way! Thanks! Gayle, it was great to see you last week and to hear about the progress of your book and to learn of the American Queen possibility. On Friday, when I received my May/June Midwest Living magazine in the mail and saw the article about the American Queen (which by the way is beautiful) I immediately thought of you. I hope this dream on your bucket list comes true for you. Happy trails! She’s still at it and so are you. Absolutely unbelievable. Words just fail me. I know you will do it…know you Will do a great job and will thrill and educate many people. It looks like a beautiful ship and would certainly be lots fun. Hope Mike gets to go with you. Thanks, all! I am indeed enjoying every bit of this. I was surprised to find that I enjoyed the writing so much – and now I am surprised again at how much fun this part of the process is as well. People keep showing up and offering the perfect help at the perfect time – and I just keep taking the next step. Thanks for taking the time to comment – I love hearing from you!